To call The Room a “film” in technical terms is correct, but in spiritual terms is blasphemy. The film lives in its own hyper-reality—a reality where first term video production students are given a 6 million dollar budget to make a film written by blind monkeys. If this were the true origin of how this film was made, it would make some sense. 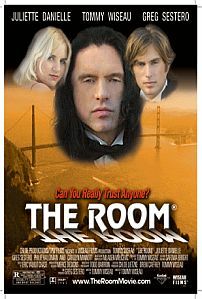 The film was the brainchild of Tommy Wiseau, a wannabe actor/director whose delusions of grandeur brought this masterpiece to life. To explain the film would be to acknowledge that there was a plot, and I don’t know if I’m physiologically ready to accept this, but I will try. Our main characters are Johnny, his fiancée Lisa, his best friend Mark, Lisa’s mom, and Denny, a strange little man-child to whom Johnny inexplicably acts as a surrogate father. The main plot is a love triangle between Johnny, his fiancée Lisa, and his best friend Mark. To go into more detail than that would be pointless, since the plot is incoherent. All I can say is that chaos ensues and Johnny commits suicide (sorry for spoiling the ending). The film is crammed with so many subplots, you’ll quickly run out of letters in the alphabet to label them. They are forgotten as fast as they are introduced without any hint of resolution. At one point in the film, Lisa’s mother casually tells Lisa that she has breast cancer, at which point Lisa tells her mom not to overreact… after which it is never mentioned again. My favorite subplot revolves around Denny getting roughed up by a drug dealer he owes money to, leading to an exchange of dialogues between Denny, Lisa, and Lisa’s mom that defies all that is logical and coherent. This scene is the best example of how people talk to each other in this film: someone asks a question and is answered with an even more baffling question. The acting in the film is unbelievably bad. Mr. Wiseau took it upon himself to play the lead, Johnny, and we are all made to suffer for it. In a film chalk full of bad performances, Wiseau takes it to a new level with his cardboard-like line delivery that is usually followed by a laugh so creepy it would scare the Joker. To call this a vanity project would be an understatement. Wiseau paints his character as a modern day saint who is too good for this cruel world. I have a horrible feeling that this film is based on events in his life that have been reimagined in his delusional mind. Despite all of these obstacles, the film has become a cult classic, falling into the “so-bad-it’s-good” category. I would like to say I am outraged by this… but I can’t. I, like many others, have gathered with friends and enjoyed the carnage that is this film. From time to time I will pull up a scene of the film on Youtube to amuse myself (although i keep the volume down). I find it to be a guilty pleasure simply because the film snob in me is appalled that Mr. Wiseau has profited from this success. But I’m probably being too hard on the film. After all, it has accomplished (in its own strange way), what a film should strive to do: entertain me.